his father died in 1957 and his mother remarried. Eventually, his mother died in 1984 of heart attack. 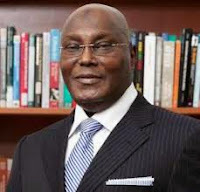 Atiku Abubakar could not start school when he ought to because his father was opposed to him obtaining western education. When his not going to school was noticed, his father was arrested and jailed until he paid a fine. Consequently, Atiku Abubakar got registered into Jada Primary School at the age of eight. After his primary school, Atiku was admitted into Adamawa Provincial Secondary School Yola in the year 1960. He later finished his Secondary school in 1965 after he made Grade Three in West African School Certificate Examination. Atiku Abubakar then proceeded to Nigerian Police College, Kaduna. He left the college for a work as Tax Officer in the Regional Ministry of Finance. Later he got admission to study at the School of Hygiene Kano in 1966. In 1967, he graduated with a Diploma. That same year, Atiku Abubakar was admitted for a Law Diploma at Ahmadu Bello University on a scholarship. He graduated in 1969 and got employed in the Nigerian Custom Service that same year. Atiku secretly married his first wife Titilayo Albert, in December 1971, in Lagos, because her family was initially opposed to the union.Titilayo begot four children for him, Fatima, Adamu, Halima and Aminu. In January 1979 he married Ladi Yakubu as his second wife in order to expand the Abubakar family having been the only surviving child of his parents, and they had six children: Abba, Atiku, Zainab, Ummi-Hauwa, Maryam and Rukayatu. In 1983 he married his third wife, Princess Rukaiyatu, daughter of the late Lamido of Adamawa and she gave birth to Aisha, Hadiza, Aliyu, Asmau, Mustafa, Laila and Abdulsalam. In 1986, he married his fourth wife, Fatima Shettima and she gave birth to Amina (Meena), Mohammed and two sets of twins Ahmed and Shehu, Zainab and Aisha, and Hafsat. Atiku Abubakar eventually divorced Ladi, this made room for him to marry, Jennifer Iwenjora who later changed her name to Jamila Atiku-Abubakar, and she gave birth to Abdulmalik, Zara and his youngest child, Faisal. Having been employed at the Custom Service, Atiku proceeded for further studies to both Police College and Custom Training School. After the studies, Atiku Abubakar was posted Idi-Iroko, a border town between Nigeria and Benin Republic. His assignments was to be in charge of the Lagos Airport, Apapa Ports, Ibadan Customs Command between 1974 and 1979. Later he moved to North and served in the Kano Command in 1976, then to Maiduguri ( as Area Comptroller) in 1977, from there to Kaduna in 1980 and back to the Apapa Ports in 1982. In 1987 Atiku was promoted to the post of a Deputy Director in charge of Enforcement and Drugs. In April 1989, aged 43, Atiku voluntarily retired from Customs. At different times, Atiku engaged in different businesses, including real estate, agriculture, trading, buying and selling. Atiku's business also includes a beverage manufacturing plant in Yola, as well as an animal feed factory. In 1998 Atiku won election as the Governor of Adamawa State, but before his swearing-in, He was called by the PDP’s presidential candidate, Olusegun Obasanjo to be his running-mate. Obasanjo and Atiku eventually won the election on February 27, 1999, and Atiku became the vice president of Nigeria on May 29, 1999. On December 20, 2006, Atiku Abubakar was chosen as the presidential candidate of the Action Congress (AC). After the election, Atiku Abubakar took third place, behind PDP candidate Umaru Yar'Adua and ANPP candidate Muhammadu Buhari, with approximately 7% of the vote (2.6 million votes). In January 2011, Atiku contested for the Presidential ticket of People’s Democratic Party alongside President Jonathan and Sarah Jubril, and lost the primary. On February 2, 2014, #Atiku left the Peoples Democratic Party and joined All Progressives Congress. On December 11, 2014, Atiku Abubakar contested for presidential ticket under the All progressive congress and lost to Munammadu Buhari who emerged the party’s presidential flag bearer.